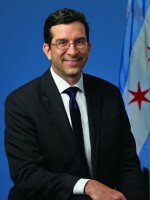 Scott Waguespack is the alderman of Chicago’s 32nd Ward, which includes parts of the Bucktown, Logan Square and Wicker Park neighborhoods. Since his election as alderman in 2007, Ald. Waguespack has been a leading independent voice in the City Council, often challenging both the Daley and Emanuel administrations on issues of transparency, finances, public safety and public education. Since 2015, Ald. Waguespack has served as chair of the 11-member Progressive Reform Caucus.